In this lesson, students will debate and defend different assigned perspectives involving the participants in the outlawing of the potlatch in 1885. Participation in the debate should allow students to make observations that will help them develop an understanding of moral implications today that derive from actions taken in the past. Students should also gain a better understanding of the historical context under which the people in the past operated. Students will identify the perspectives of the agents present at the time and make observations about the moral implications behind historical conflicts and how they influence today’s policymaking. They will also analyse post-Confederation government policies and jurisdictional arrangements that affected, and continue to affect, First Nations peoples. The potlatch is a traditional gathering held by many coastal aboriginal groups. The word itself is said to derive from a Chinook Jargon word that means, “to give.” The host was expected to present each of his guests with gifts. A potlatch was a means of confirming in public any changes in status such as births, marriages, deaths, or coming of age. A great potlatch could have been many years in the making, might have lasted for several days, and involved fasting, spirit dances, theatrical demonstrations, and distribution of gifts. For many Aboriginal groups, especially the west coast groups, the potlatch was a ceremony of significant importance and the heart of their way of life. On 19 April 1884, PM Sir John A MacDonald and his government amended the Indian Act, passing the Potlatch Law, which made it illegal to encourage or participate in the potlatch ceremony. In 1895 the government passed another amendment, Section 114, which banned any Indigenous festival, dance or other ceremony that involved giving away, paying, or giving back money, goods, or any kind of articles. A jail term of two to six months was the penalty for any Aboriginal who engaged or assisted in potlatches. Time Allowance: 3-4 class periods. This exercise makes reference to the Benchmarks of Historical Thinking concepts of Historical Perspective and Moral Dimension. Class discussion to ensure understanding of the concepts may be necessary; the amount of time spent on this topic is up to the teacher’s discretion. 1. Students should familiarize themselves with the concept of “potlatch” by doing an Internet search and by reading the material in The Canadian Encyclopedia. Class discussion to follow should suggest different perspectives of the agencies involved, namely the government, missionaries, and chieftains. 2. Organize, or have the students organize, debating teams. 4. Provide time for debating teams to meet and for team members to refine their roles within the team. 5. Take appropriate time for debates to be held; one or two periods. 7. The teacher may wish to assign written summaries or continue with class discussion regarding how the different points of view presented have influenced the student’s own sense of moral judgment and perspective. 8. Depending on time and interest, further study regarding the Indian Act of 1951 and its revisions could be added. Have students investigate a First Nations community local to your community to determine if they have/had ceremonies equivalent to the potlatch. Have them discover how the group fared under the government restrictions. Assess the multicultural background of the class. Research important events in the various ethnic backgrounds found among class members. Have students explain the origins of such celebrations. 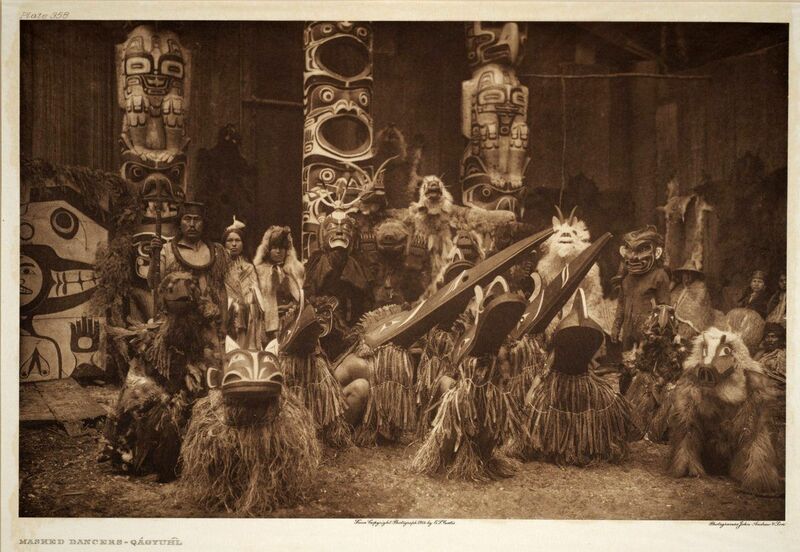 Investigate the symbolism behind the masks worn at a potlatch and/or the masks evident in the photograph.